19 inches is the average distance from the head to the heart. It is a quantifiable measurement but it is also a poetic statement. And it can be a self-portrait. The head, the brain, is the site of logical thinking, and the heart is where these thoughts become passions. 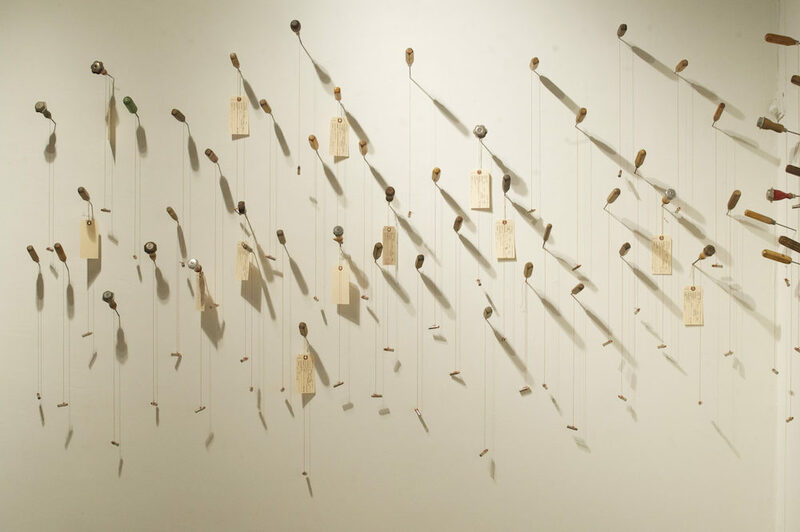 In his 2016 installation (dimensions variable, site specific), artist Clint Imboden suggests that this measurement embodies that moment of transference by eloquently linking implied acts of violence with intimate memories of those who have passed. As such,”19 inches” is also a meditation on death. This work is site specific and in its most recent iteration occupied two walls of the gallery space at Autobody Fine Art. 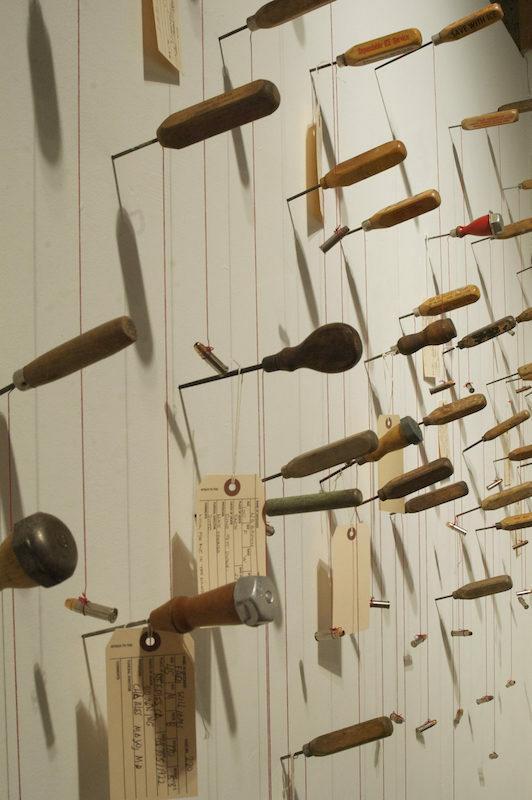 Over seventy vintage icepicks with softly-weathered wooden handles, and rusted and patina’d barbs were stabbed at regular intervals into the gallery walls. 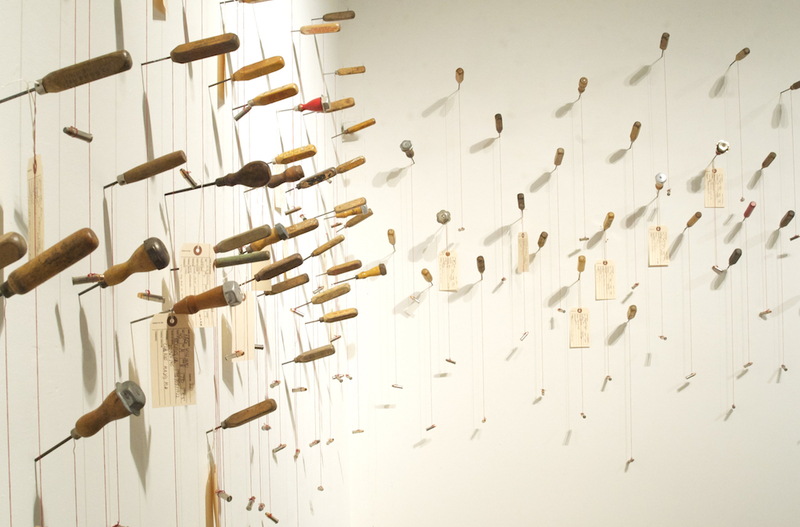 Hanging from each pick, tied where wood yields to metal, is a nineteen inch long, thin, corded red thread. Physical and emotional weight is awarded to each pick by the 38 bullet which hangs motionless from the end of the string. 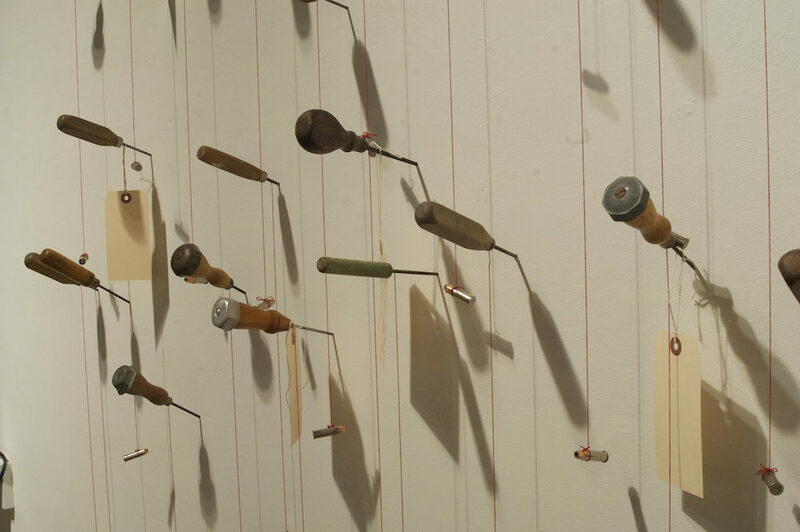 At Autobody these picks dovetailed in the corner of a room so that as the viewer started to experience the installation they were moved into a position where the implied violence started to surround them. Unlike many installations this artwork is participatory and requires the audience’s cooperation in completing its narrative. Located in close proximity to the ice picks is a shelf on which are placed a number of blank vintage mortuary tags and an appropriately weathered Acroprint time clock. The audience is invited to fill out a mortuary tag, run it through the time clock and then tie it to an ice pick of their own choosing. The tags flutter slightly as you encounter the installation, each one hand written with a small story of the passing of a life. Known by only the writer of each tag there is a sense of anonymity about the stories that further complicate and frustrate the need to understand mortality. 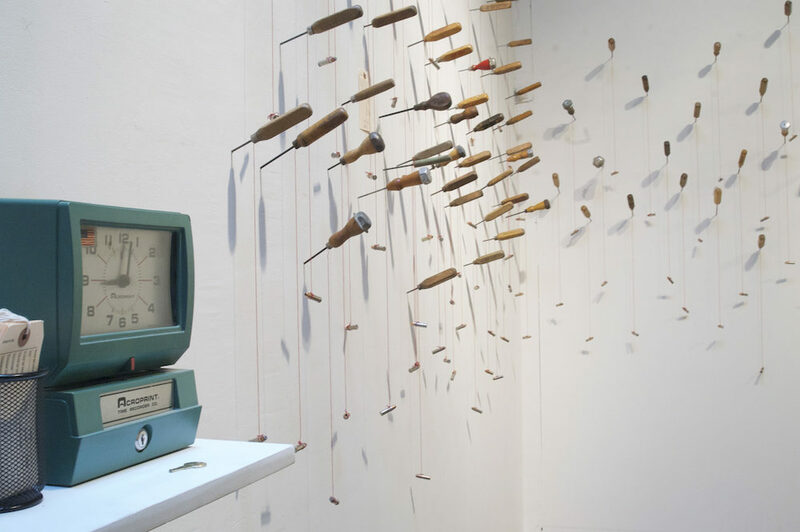 Clint likes to re-imagine the (past) lives of vintage objects, frequently employing mechanical hand tools (such as icepicks) in the service of visual poetry. There is nothing, however, nostalgic about his artwork as the questions raised and the answers proffered by the work are timeless. The flight from the head to the heart is one of joy and affliction, of turning words and ideas into desire and belief. 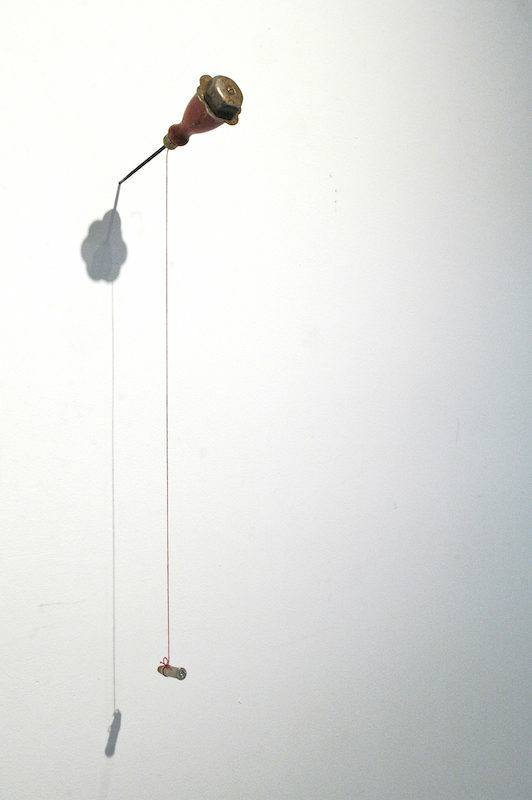 That’s a very long 19 inches and a highly personal journey but it is made corporeal in the elegant and restrained use of materials and objects that is a trademark of artist Clint Imboden. 19 Inches, Balance, detail. Photo credit: Jacqueline Cooper, director, Autobody Fine Art. 19 Inches, mixed media, 2016. Photo credit: Jacqueline Cooper, director, Autobody Fine Art. 19 Inches, side view. Photo credit: Jacqueline Cooper, director, Autobody Fine Art. 19 Inches, detail. Photo credit: Jacqueline Cooper, director, Autobody Fine Art.